This is it! The biggest and final event of the Organized Play season was held in Parramatta, Australia on the 23rd through 27th of September. This massive event was the culmination of months of planning from director of Organized Play Matthyas Kiraly and Australian Organized Play Coordinator Steve Hartmann (among many others). You may have seen other recent articles with video recorded championship games or Fritz Meissner's experiences, or you may have followed along with the results megathread throughout the weekend. There have been many ways to soak up the action recently; I even got to watch the Second Edition finals streaming live! In 2013, at the World Championships held in Germany, we had our first World champion to simultaneously hold the title in both editions of the game: Stefan Slaby. This year, Kenneth Tufts became the second player to win both championships in the same year, having previously taken the First Edition title in 2012 (and even Tribbles in 2013). Not only are those victories incredible achievements, he remained undefeated throughout days one and two in both editions - his worst result was a true tie in game two of the Second Edition finals. See also: Ken's Illegitimate Klingon solver was last reviewed in week 8. See also: In week 3 and week 14 I reviewed decks that use several of the same engines, but this particular combination hasn't been seen as much since Danny Nuttall and a Ken Tufts came in 2nd and 4th at 2013 Worlds with it. The deck clearly still has it. Congratulations on winning the title in both the First AND the Second Edition World Championships! How do you feel? Let's talk about your First Edition decks first. What factors did you weigh when making the decision about which deck to play on each day? For day one I just wanted a solid pure speed deck really, but with some thought to make sure it could deal with QI. For a moment thought about trying to make sure it was worth a play X hit for achievements but then said nah. Day two I knew I had Justin up first so I needed a plan to deal with Kazon battle as I assumed he would play that. I had Bajoran and Terran Empire decks for that, but Bajoran had the advantage of Dabo to help with possible mod wins later as well. I also just really like my 1e Bajoran deck a lot and always have fun with it. What other decks did you consider playing? 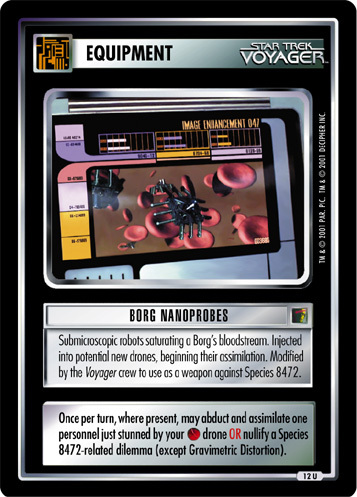 The three decks I had with me were the TNG Klingons(day one), Bajoran solver(played day two), and Terran Empire solver - a tweaked version of my standard TE achievement deck. Had I had more time before leaving home I was toying with a really crazy shipless TNG Klingon solver for day one but I ran out of time to work out the kinks to where I was happy with it. Well, that and I was happy with the three I had already. There's been a lot of discussion about the power level of Quantum Incursions and The Genesis Device leading up to Worlds. You only used one QI total between your two 1e decks, and didn't use The Genesis Device at all. What are your thoughts on the power level of those cards? QI can be good but it can also be useless in that you hit the easy requirements or they come prepared specifically for it and walk through it. While I think Genesis Device can be very powerful it is also high risk, one Disruptor Overload and it's gone. If you build your deck around the Device, losing it hurts a lot as it's normally going to take two seed slots. Also I expected smart players at Worlds would be running one or more Kobayashi Maru Scenarios (And I was right on this, I saw a lot of them), and those self seed locations just beg for the Kobie to be stacked on top of them making those missions the last ones you're likely to want to go to rather then the first. For these reasons I did not consider the Genesis Device risk versus reward a good enough ratio to run at Worlds. I do love that the Genesis Device is actually seeing some play, I think that is a good thing. I feel that unlike the people that seem worried it's at a fair and balanced place because it does have some counters to its use already in the game and in the current meta even. Previously, I've seen you turn to Terran Empire/Bajoran Resistance Cell decks when attempting to outmaneuver interactive decks, but this time you went for a more conventional Son'a/Bajoran build. In fact, you faced Kazon Battle and two Borg decks in the finals; why the change in strategy? Boredom… I have played Terran Empire a lot recently for achievements and I missed my Bajorans. In a "mod win is enough" situation, the Bajorans actually have some better tech against Kazon battle in sitting safe at home playing Dabo, while the TE actually have to solve a mission for points. That said, the 3rd deck I had with me was an updated version of the TE deck, but the day of the tournament my gut said Bajorans so I went with them. At Worlds last year, your Bajoran build also included the Maquis and leaned on Kivas Fajo - Collector rather than just Renewal Scroll. What prompted these adjustments? The Maquis stuff, while good, spread out my reporting locations, and though it added in theory more personnel, it started to get to the over complication point so I simplified my reporting locations a bit this time. Re: Renewal Scroll, with Deputy Quark and actually rembering what it did I decided it was a good idea to swap to it. It can be used to really fill the discard pile for dabo if needed, though a couple times when I did not want to toss any thing. I did miss the extra draw Kivas Fajo - Collector would have given, so future versions I might look to mix a few KFC back in. The only difference between your day one deck and its Regional season counterpart is a pair of Preparations. Did you find the addition of those Preparations to be valuable, or would you drop them if you ran the deck again? I would keep them, though they were far from I win buttons. They were handy in some games, while in others they were a dead draw as what I saw was useless info, or drew them too late. 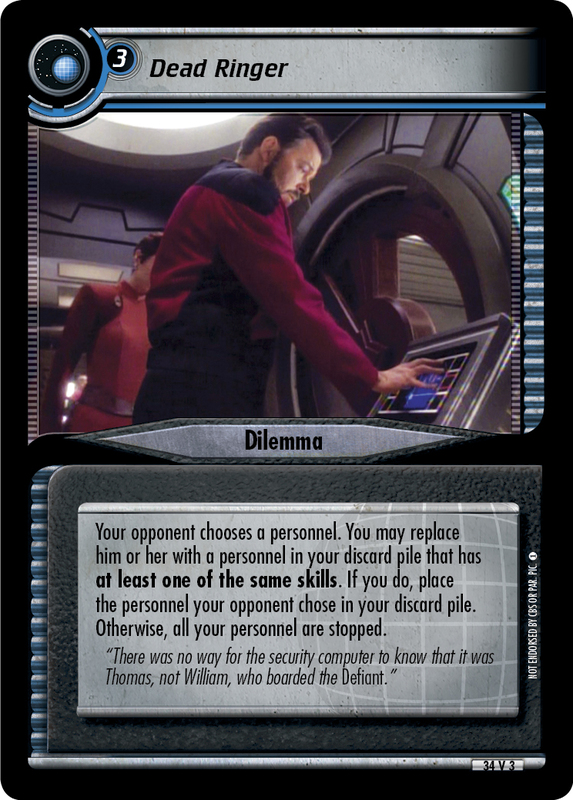 I like them because some people run very standard combos, so you can get a lot of info from the lead in dilemma. On the other hand, sometimes people fool you and it backfires and you lose more than if you had never looked. In general, are there any other changes you'd make to the decks if you were to play them again? Both decks ran well, but the Bajorans could probably use a few Renewal Scrolls swapped out for good old KFCs, I'd run a few of each. What would you nominate as the MVP cards from your First Edition decks? Day one: ummmm, hard to say if anything was a really MVP, it's more the combination of how it all works together, but picking one I’d say Continuing Mission because that makes every thing else work. Day Two: DABO!!! Because that’s what every point in my first game came from, and was aiming to be my key to the win when I got lucky on a late game mass attempt that actually solved the last mission with out Kobayashi on it. Do you have anything else to say about your First Edition decks? Borg Nanoprobes is making a comeback as Your Galaxy Is Impure makes its comeback. Let's move on to Second Edition. This time around, you played the same deck on both days. Why didn't you switch things up, considering that the types of decks you see on day one and day two can be substantially different? Technically the day two deck added one more dirty Shran to help in possible longer lock-out type games. As in 1E, I had three 2E decks with me, but after the deck did so well day one I figured that I couldn't quit a horse that’s winning. The original plan had called for a different deck, but I had faced a few decks day one that were not too far off from day 2 possibilities (Romulans for example), so I just went with it. It was handling some semi-control decks on day one very well so could not quit on it. I had Big Green Romulan with me, as well as an updated DS9 solver, both of them running heavy consume kill piles. The only draw deck changes between this version of your TOS deck and previous ones would be the inclusion of two Dukats (Pah-Wraith Puppet), a Sisko, and a Shran. What was the goal with these changes? Sisko was to help with counter-spells, he had been sooo useful previously and as the deck had gotten a little bigger I was not drawing him enough so wanted a second. Dukats & Shran (two on day two), were there to try and cycle Dead Ringer for the lock out possibilities. Your dilemma pile underwent a more substantial revision, reducing in size by a full six cards. What prompted the pruning? DEAD RINGER!!!! I have been brick-walled by this dilemma locally a lot, it's very hard to deal with on its own. I figured that, combined with some Dukat & dirty Shran tricks, it could be worse, so I wanted to strip it down to draw that more while not totally relying on it. I removed the killing dilemmas as they only help get people in the discard for my opponent, the dilemma pile was the all star of these games and what set the deck apart from the more original version MVB, (the originator of the core draw deck/mission plan), was playing on day one as well. If you were to run this deck again, would you make any further changes to it? You never know what new stuff might come up, but on the whole I like this version a lot. Shifts in the meta are always happening though, so I might have to tweak things anyways. At the moment, the deck is in retirement though as it’s not good for any achievements I need, and I don’t have any events coming up where I will value winning over possible achievement hits. On a scale of 1-10, how much were you sweating going into the final with Michael Van Breemen while you were using a deck that he popularized? A metric TON, I also knew what he was playing and I thought I was hooped, I knew if he could keep me at -2 attributes I could be in huge trouble in space. What I misjudged was just how slow his deck was at solving, and just how good attempting planet with Kirk and upgraded Daystrom would be allowing for the field studies to help out in space. What would you nominate as the MVP cards from your Second Edition deck? DEAD RINGER! It might as well have read stop all your personnel and not had the clause to pass it, even in games without Dukat’s assistance it was amazing. The only person who was ever in a position such that I could not throw it, while being near 100% sure that it was an all stop, was Justin as he was playing Relativity so he could fill his discard pile (and normally does so early on), and I went first, and failed to draw Dukat. This dilemma is just crazy good, the interaction when they have no one in discard is just crazy and unless they have a ton of people, you can find someone that doesn’t match anything fairly easily. Caretaker's "Guests" also becomes a great lead in to it because it becomes a huge meta game of are you SURE you really want to return that personal in your discard pile to the team? Do you have anything else to say about your Second Edition deck? I think I covered it all in my babbling already. Well, that's it for this year's Road to Worlds season! It's over! Go home! I'll see you again next season. Let's just check when that's starting, I'm sure there'll be a nice long break. What's that? Russian Nationals just happened, and the American National Championship is just around the corner? Okay, see you next week with an interview with Andrey Gusev, the winner of the Russian National Championships!